Catapulted to the edge of Doom’s home world by the rituals of banishing, battle-hardened heroes now lay siege to this grim, forsaken place. Employing trusted villagers, weapons, spells, and items, these heroes must fight past terrifying monsters, navigating the suffocating darkness in search of Doom. Worlds Collide features cards from the original classic Thunderstone releases and promotional sets. These cards have been reformatted to the Thunderstone Advance template, and, in some cases, rebalanced for better play with other Thunderstone Advance sets. The set is a complete standalone product, and so is ideal for new and experienced players alike. It is also fully compatible with other Thunderstone Advance sets, including Towers of Ruin, Caverns of Bane, Root of Corruption, and Numenera. 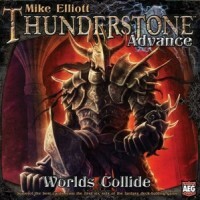 Add a Review for "Thunderstone Advance: Worlds Collide"